Ramakrishna experienced the truth of all religions, inspiring seekers of every creed. 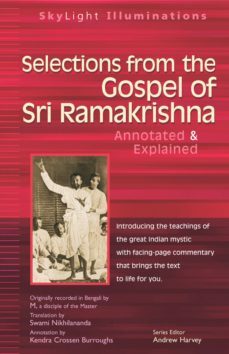 Now his “gospel” is made accessible to all readers.Ramakrishna is India’s greatest example of God-consciousness and mystical ecstasy in recent history. He became known to the world not merely as a saint but as a divine incarnation and a “supremely realized self.” His message has inspired millions of devotees for more than a century—and now his teachings are made accessible to many more. Introduces the fascinating world of the Indian mystic and the universal appeal of his message. Now, readers can explore this classic text without any prior knowledge of Hinduism. Selections from the original text and insightful yet unobtrusive facing-page commentary highlight the most important and inspirational teachings, including: How to see God and how to live in the world.Religious harmony. The dynamics of spiritual awakening.The spiritual power of the Feminine. Prayer and meditation.